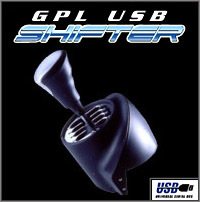 PLEASE NOTE: The GPL USB Shifter is Currently OUT OF STOCK. If you place an order for this item, it will not be processed until the new stock arrives in about 6-8 weeks approx. The GPL USB Shifter takes racing simulation to a new level of reality. The shifter "drops" into each gear with a realistic feel. And get this... you can gear down from 5th to 2nd in one swift motion. So go ahead - attack that hairpin corner! It is even possible to mount after-market shift knobs! We also offer accessory 4 and 5 speed plates! Got a question about a product? Send us an e-mail message. in the last 5 years. See our special ACT LABS Shifter Utility area for more information!